This Roman Countryside Half Day Pre-Cruise Tour and Transfer combination offers our guests the unique option of spending the first half of their day enjoying the beautiful Roman countryside and then go straight to Civitavecchia Cruise Port to board your ship. You and your luggage will travel together and remain safely inside the vehicle under the care of your English speaking Driver while you sightsee so you have no worries but all the fun in the countryside! Pick up time will be 9 AM at your accommodation in Rome. Transport to Port of Civitavecchia is included. 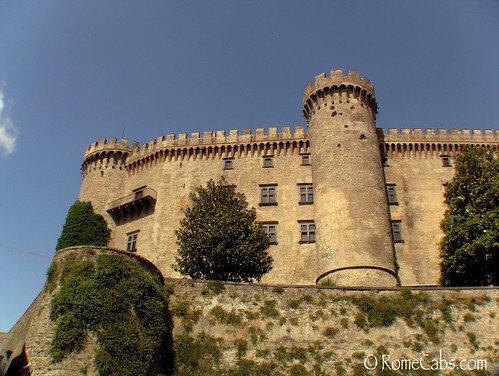 You will enjoy a leisurely drive through the Roman countryside to your first destination, the lovely Lake Braccciano and its famous Bracciano Castle (officially named the Odescalchi Castle). Lake Bracciano is actually a volcanic crater with among the most pristine water in all of Italy. Surrounded by beaches and charming medieval towns, Lake Bracciano is one of the most sought after getaway destinations for the locals seeking a respite from the bustle of big cities like Rome. On the shore of the lake is the famous 15th century Odescalchi Castle was built by the powerful Orsini family as both a private residence and defense fortress. Eventually it was sold to the Odescalchi family 2 centuries later to which the castle still belongs to today. Today the castle hosts important cultural events and high profile weddings, and can its premises can be visited. From here you will journey to the nearby medieval hamlet of Ceri, a charming 13th century fortified castle built on top of a tall rock formation. Inside the village is the Romanesque church of Madonna of Ceri that was built on top of an ancient site where Etruscans and Romans venerated the pagan goddess Vesta. Beautiful 12th century frescoes with scenes from Old Testaments grace the walls of the church. In the midst of this charming village surrounded by aged medieval buildings of ochre and sienna colored exteriors are some of the best restaurants in the region that specialize in traditional cuisine prepared from fresh local ingredients and secret recipes passed down through generations. After lunch in Ceri you will depart for Civitavecchia and sail on your cruise! * The price of the Pre-Cruise Roman Countryside Tour and Transfer includes private deluxe vehicle with a professionally licensed English speaking Driver, Transportation to Civitavecchia Cruise Port, Italy VAT tax, fuel, tolls, insurance, and parking fees. * The price of the Pre-Cruise Roman Countryside Tour and Transfer does not include entrance fees into Odescalchi Castle, lunch, gratuities, private tour guide if hired separately for the castle visit, or other client personal expenses. * If you are a party of more than 8 persons, please Click Here for information on booking multiple vehicles for 9 and more passengers. Each vehicle booked is a separate reservation and priced separately. Entry tickets to Odescalchi Castle is currently 8.50 Euros per person to be purchased on site upon arrival (ticket prices are subject to change without notice). Odescalchi Castle offers private tours in English upon request and advanced booking at 120 Euros including the tickets. Please inform us in advance if you wish to have a private guide so we can book one on your behalf. Otherwise you will be joining a larger group with Italian speaking companion. LUNCH is available only in Ceri. Please note that in Ceri there are only local restaurants, no panini or pizza places are available. Depending on what you order, the average is 20 Euros per person for lunch at any restaurant you choose in Ceri. You must be in agreement to lunch in Ceri at the local restaurant of your choice in order to participate in this tour. This tour includes an English speaking Driver who is not a Licensed Tour Guide. Italy laws aimed at protecting licensed tour guides prohibit Drivers from acting as a guide and to accompany guests away from the vehicle to sightsee. Your driver will be obliged to remain with the vehicle while you sightsee. 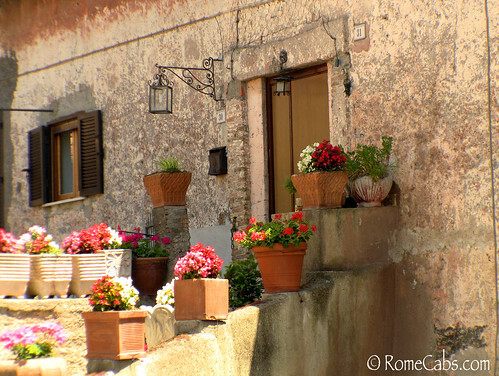 If you are pleased with the service of your driver a 10-15% gratuity is customary in Italy. Payment for the tour will be made in Euro funds at the end of your journey. If you wish to pre-pay in advance you may do so via PayPal. Please let us know when the service is confirmed if you wish to prepay. We will not ask for your credit card information to reserve any services you book with us, or charge you for cancellations. We operate on the time trusted honor system, so we simply ask that all cancellations be made at least 7 days in advance so we have the opportunity rebook your service and your reserved driver does not lose work for that day. We greatly appreciate your kind cooperation. IMPORTANT: ALWAYS CHECK YOUR SPAM FOLDER. If you submit a reservation or email and have not heard from us within 24-48 hours please check your spam folder, especially if using hotmail and msn accounts. This tour designed for experienced travelers and cruisers with interest in history, culture, nature and great food! This tour may not be suitable for travelers interested in tourist attractions or fast food eateries.